Parents: How High Does Your IQ Need to Be To Raise Your Children? Amy Fabbriniand Eric Ziegler lost custody of their two sons, Christopher and Hunter, shortly after they were born. Oregon’s Department of Human Services (DHS) allegedly removed both boys because their parents had low IQ test scores.The children are in foster care, but Fabbrini and Ziegler have supervised visitation. According to documents filed by DHS, Fabbrini tested IQ was at 72, placing her in the “extremely low to borderline range of intelligence,” and Ziegler’s about 66, placing him in the “mild range of intellectual disability.” The average IQ is between 90 and 110. Neither of them are currently employed, but thanks to Ziegler’s parents, they have steady housing. The couple each have high school diplomas and Fabbrini has had shared custody of twin boys with her ex-husband. The idea that the state can remove custody from parents merely because the parents have a low IQ should be repugnant to most people. Exactly who determines whether one’s IQ is high enough? How would such a test even measure intelligence? And why are “smart” people more qualified to raise someone else’s child? State Service Departments should have more guidance in cases like these so that they don’t become draconian. Fortunately, there enough guidelines that State Services should know better than to treat mentally disabled individuals like this. 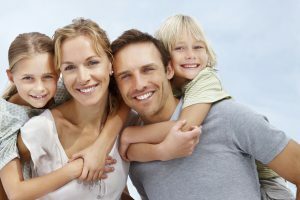 As with any child custody case, the best interests of the children always come first. If the children are threatened or neglected, DHS should step in. However, there’s no real record that’s the case here. The only allegations are that the father doesn’t always feed the dog and that he almost slept on the baby once. Most case law features far more serious allegations and crimes than the two instances described – physical abuse, sexual assault, drunk driving, etc. Most courts would be very happy if the worse thing a parent did was sleep next to their infant son. At the same time, we don’t want to discriminate anyone just because they’re different than “normal” parents. Disabled Americans have often faced discrimination, but we have gone further to ensure that disabled individuals are included in society. If a disabled person seeks employment or wants to continue employment, we have required businesses to accommodate their disability, sometimes even at a loss to the employer. Granted, child custody is different, since the disabled individual would be taking care of a helpless human being instead of working to provide for him or herself. Raising a son or daughter is certainly a bigger obligation than taking care of one’s self. But if we really want disabled Americans to be included in society, disabled Americans should have a chance to raise a family of their own. We can’t cut off disabled Americans from the most fundamental aspect of our culture and then pretend to be inclusive. However, removing child custody just because of a disability would not only violate the rights of the parent, but it might also harm the children. It might bother a child to have a father in a wheelchair all the time, but not having a biological parent even though the parent is alive and willing to take care of the child might be worse. Many states have passed laws requiring a connection between a parent’s disability and parental misconduct. In other words, it’s not enough the parent might have a disability, but that the disability is somehow preventing the parent from taking care of the child. Physical or mental disability alone should not be the sole deciding factor in removing custody of a child. Oregon State Senator Tim Knopp has introduced a bill that would codify this ideal into Oregon law, but the bill has not made any progress in Salem. If this case concerns you and you live in Oregon, consider contacting your state representative and ask him or her to support Senator Knopp’s bill.